Sleeps 10 Guests in 4 Staterooms, 2 with Pullman: 1 Full-beam Master with King + 2 Identical Twins with Pullmans + 1 Full Beam VIP Queen, each with private bathroom. Based in Greece, this fast, 90′ Pershing (Italy), modern, semi-displacement motor yacht, SOLARIS, will get you to Mykonos in no time! Capable of reaching an amazing 42 knots, her cruising speed is more comfortably 32 knots, consuming 900 liters of fuel per hour, and while this may seem like a lot, it really is not a lot as it takes only three hours to get there! Living is mostly done on the main deck, where the modern, industrially-appointed saloon offers spacious seating around an orange leather, U-shaped settee with large glass coffee table and ottomans. But guests can also spread out to an enormous aft deck dining area with sunbathing. Or they can enjoy the sundeck, which can be set up to either be all bed for sunbathing or as two bench settees around a table. The crew can set up a bimini awning for guests, if shade is needed. Very narrow sidewalks lead forward from the cockpit to the bow, where there is additional seating and dining, and sunbathing with optional bimini shade awning, and you can also access this area more comfortably from forward of the saloon, where there is a second, spacious dining area with enormous glass table and matching brown leather chairs. All is modern and lovely! 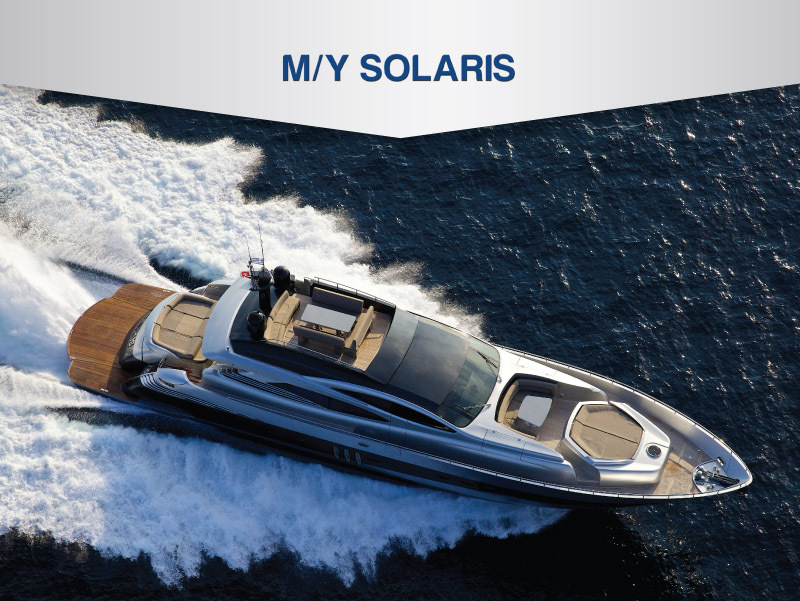 Captain Athanasios Vouruopoalus and his team of four have operated SOLARIS for charter in Greece, Turkey, and Montenegro since 2008; they are congenial and discreet. Beautiful bowl sinks are found in the four guest bathrooms under the saloon, where there is a full beam master stateroom with King bed on an angle in gray and orange with silver lamps, wood floors, and screens on the windows. A brown desk has internet, and the beautiful bathroom has blue tile stall shower and separate WC, plus two closets. Two mirror image twin cabins are amidships, and each has a Pullman berth for parties of ten. These cabins are in brown with mirrors, and the second full beam VIP guest cabin has an angled Queen berth, couch and skylight. It’s a circular room! This yacht is stunning! Please email us for a PDF Brochure.